Academic excellence is at the heart of what we hope to achieve as educators. We aspire to provide students with rich and deep learning experiences and anticipate our craft will prepare our graduates for a fulfilling career and help them make a positive contribution to society. We accomplish these lofty goals through our faculty and professional staff and at first glance it would appear that academic excellence is a somewhat simple and straightforward concept. Where academic excellence becomes more complex is when one is asked to define it. That is what occurred recently when I was asked to share my perspectives on academic excellence with a small group of individuals. My first sense was to provide a simple response of “yes, I am all for it”. Knowing that was not quite acceptable, it led me to share a variety of views with the group while at the same time convincing me that academic excellence is a non-trivial concept. My take away from that discussion was to take some time to think more about this important topic and that is the purpose of this blog. The complexity in defining academic excellence is partly due to the changing nature of higher education. This complexity is also related to the personal context and personal lens through which one views academic excellence. There are a number of other factors that contribute to the complexity of finding a simple definition of academic excellence. These include increased regulation and accountability measures, decreased government financial support, the implementation of performance-based funding formulas and increased competition for limited resources. However, defining academic excellence goes beyond financial challenges. Today, universities and colleges are grappling with new models of program and service delivery and re-defining what effective teaching and student learning means in the 21st Century. 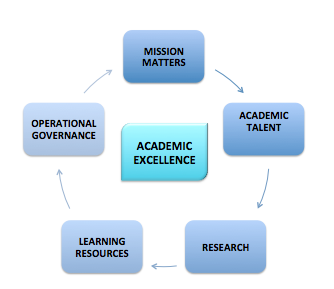 Each of these factors complicate how one views and defines academic excellence. Generally, I think of academic excellence as creating an environment whereby a student can excel in scholastic activities, demonstrate superior learning and develop intellectual capacities and skills that prepares them for service to their community. The more complex issue of academic excellence is not what it may be but rather how to achieve these objectives. Therefore, the purpose of this blog is to examine some of the interrelated components that serve as the building blocks for universities and colleges to achieve academic excellence. 1. Mission Matters: Every academic institution has a defined mission – a purpose for existence. This is not to be confused with what a university does or how it does its work but rather “why the institution exists”. Academic excellence must be interpreted and developed within the context of the institution’s mission and how the university prepares students for success within their chosen field. 2. Academic Talent: Achieving academic excellence requires an institution to attract and retain exemplary faculty. 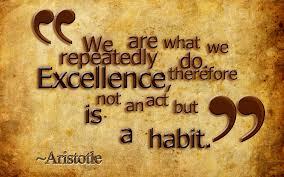 Thought leaders, great teachers and outstanding researchers are the fundamental drivers of academic excellence. With change occurring in higher education at unprecedented levels, professional development and support must be provided to and embraced by faculty in order to sustain excellence. 3. Research: Research informs professional practice, creates new knowledge and is an essential component of an institution’s commitment to service. Academic leaders support the faculty in their efforts to secure resources from funding agencies while also providing appropriate infrastructure to support faculty in conducting research. Research is a critical component of academic excellence, particularly at the university. Academic excellence through research is best achieved when the institution has a supply of graduate student talent. These institutions have the ability to call upon this talent to create research teams. Where a school has fewer grad students, they commit to increase the number of researchers and research teams by embedding research in the undergraduate curricula. Enhancing an institution’s research agenda enriches academic excellence. 4. Learning Resources: Colleges and universities dedicated to academic excellence demonstrate a commitment to securing and allocating more funds per students. An abundance of funding is necessary to invest in learning facilities and for attracting and retaining top teaching and research talent. As an example, highly ranked universities often have annual per student expenditures that surpass $40,000 / student. Developing a diverse source of investment resources including alumni and friend giving and access to research funding is critical to achieve academic excellence. 5. Governance: Appropriate operational and regulatory frameworks, strong and inspiring leadership, and adequate management capacity significantly influences the ability of universities to prosper. How the institution governs itself is also an essential element in achieving academic excellence. I have addressed governance matters in previous blogs and a pillar of my own research relates to what I have called preemptive leadership. I strongly advocate for decentralized decision-making where staff are free of burdensome centrist bureaucracies. Professional autonomy ensures institutions enjoy the best of two worlds – increased agility to react to new market opportunities while also giving faculty and staff the opportunity to act more entrepreneurially and take advantage of emerging opportunities. Academic excellence is complex and is framed by the context of the respective institution wanting to define it. To create a very specific definition of academic excellence is less important than it is to understand the environment in which an institution can attain excellence in its respective situation. This blog introduced five characteristics that I believe influence the university or college’s ability to attain this important and lofty goal of excellence within the Academy. I believe that if a university or college embraces these characteristics, it will be better positioned to attain its stated academic excellence objective. Thanks you very much for this very interesting posting. Becoming a part-time faculty for Algonquin college after a long international career, I really enjoy the orientation provided to new faculty and was very impressed by your college. I made a short lecture on ” Value Management ” and the importance of it in successful Companies and in preparing I looked at the Algonquin Mission / Vision and Values information on the college site. I was surprised not to see any mention of commitment to Academic Excellence which I read in this blog. I do believe ” Academic Excellence ” should certainly be mentioned and explained in the Algonquin important statement of Vision / Mission & Values. It would enrich it greatly . The Values if applied should lead to Academic Excellence and inspire the faculties, the students and staffs to work toward this ultimate goal. I might suggest a review of the Value statement in this direction allowing the introduction of this ultimate goal for any educational institution. Being a true believer of the importance of ” Value Management ” I would also suggest to have a direct or easier access to this statement through better visibility on the Algonquin College internet page. It did take me some time to find it. For numerous top Companies putting a strong importance on Company Values , those can be accessed directly from main page. Once again thanks for your reflexion and pursue of Academic Excellence and my experience in following the new faculty orientation recently provide me with a good understanding of the enormous efforts and resources directed to reaching your Vision and Mission statement. Thank you for your thoughts. We will likely begin to renew our Strategic Plan in 2015 and I know with certainty the vision / mission will be reviewed. With much opportunity for input! Great ideas…. Thanks.